Thukker Tribe is one of the seven Minmatar tribes. Even though the Thukker tribe is not part of the Minmatar Republic, the two have close unofficial ties. The Thukker tribe is one of the seven original Minmatar tribes. After the Minmatar Rebellion the Thukkers left Minmatar space and took up the nomadic lifestyles of their ancestors, only this time in space. The closest thing they've got to home is the Great Wildlands region, where they are very numerous, but the Thukkers like to be on the move, constantly going from one solar system to another in their huge caravans, trading and scavenging. Respectable citizens of EVE frown upon the Thukkers, considering them to be nothing but scoundrels and thieves. Indeed, the Thukkers often operate on the shadier side of the law, but their resourcefulness and diligence count a lot more for their success than their criminal activities. Thukker tribe ships can be encountered in few level 1-3 missions. The Thukker frigates deal explosive and kinetic damage while Thukker cruisers deal explosive and thermal damage. The best damage to use is thermal with EM being second best damage to use. Many of the T2 Minmatar hulls are of Thukker origin. These ships are easily identified from the iconic brown-white camo pattern. 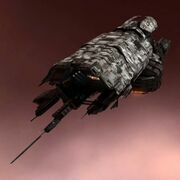 The Thukker ships are well suited to the nomadic life: fast combat ships, scanning ship, fast logistic ship, black ops battleship and a jump freighter. This page was last modified on 17 April 2019, at 19:30. This page has been accessed 4,344 times.